500+ Easy Ways to Accomplish More at Work--That Actually Work! Improve your productivity, increase focus, and enhance your organizational and time management skills with these 500+ easy tips and tricks for getting more stuff done. We all know about Post-It notes and to-do lists—and now, with this handy guide you can take productivity to the next level! Learn to use technology to your advantage, schedule your time wisely, and organize your materials for maximum efficiency. Some of Productivity Hacks’s easy-to-implement tips include utilizing “do not disturb” features on your phone and computer to avoid distractions, scheduling a specific time to check your email instead of shifting focus again and again, and creating templates for your most-used email responses so you don’t need to do the same work twice—and many more! From accomplishing more in the workplace to maintaining a healthy work-life balance, these tips will help hone your focus and time management skills in simple, manageable steps. You’ll be amazed how much more you can achieve over the course of a day! "The productivity craze shows no sign of slowing down, with people looking to maximize every second of their increasingly limited time. 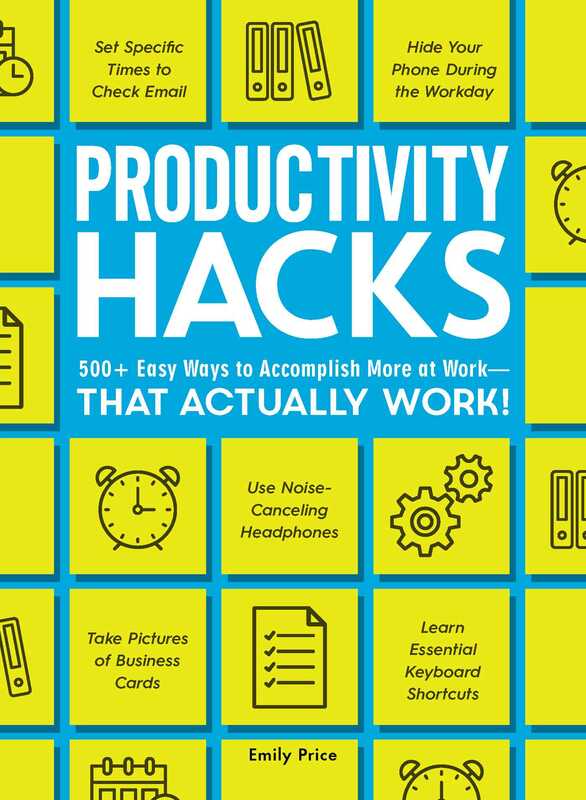 A book with over 500 productivity hacks specifically for work – tackling everything from running meetings to business travel to working from home." "With the last page of the year almost ready to be turned, many people are thinking about how they're going to behave differently in 2019. If getting more done is something you'd like to achieve, take some tips from Emily Price, author of Productivity Hacks: 500+ Easy Ways to Accomplish More at Work. Here are a handful of her best ideas."